The term dementia describes a set of symptoms including memory loss, mood changes and problems with communication and reasoning. Dementia is not a natural part of growing old. It is caused by diseases of the brain, the most common of which is Alzheimers. There are presently about 800,000 people with dementia in the United Kingdom, two thirds of whom are women. Wymondham Dementia Support Group was formed in 2008 with the objective of ‘Promoting the well-being and quality of life of people with dementia and their carers in the County of Norfolk’. We are a small local charity responding to local need – all of our trustees and volunteers live in Wymondham and the surrounding parishes. 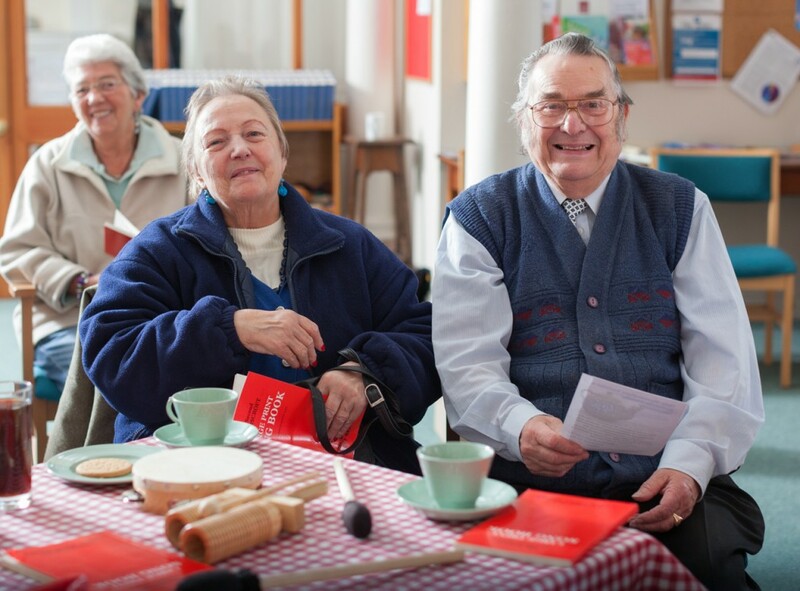 Our main service is the weekly Pabulum Café which meets at the Fairland Church Centre in Wymondham from 10am to 1pm on the 1st, 2nd, 4th and 5th Friday of each month and on the 3rd Friday we have ‘The Singing Café’. ‘The Monday-Monday Club’ opens every Monday between 10am and 12noon (except for Bank Holidays) and offers a quiet and reflective time where those with dementia and their carers can enjoy conversation, coffee, refreshments and support from our experienced volunteers. The Pabulum Picture Palace shows popular full length feature films in our Dementia Friendly cinema each month. Refreshments including ice-cream are available and sometimes a piece of cake! Our Dementia Friendly Garden is sited upon land adjoining Fairland United Reform Church. We encourage members to take an active part with the flower beds and vegetables. It also provides a delightful setting for quiet reflection. We also run an indoor Sports and Leisure service in the Fairland Church Hall which meets on the 2nd, 4th & 5th Friday of each month opening at the same time as The Pabulum Café. Fuller details of all of our services can be found under the ACTIVITIES menu. IF YOU NEED HELP WITH TRANSPORT PLEASE LET US KNOW AND WE WILL ARRANGE IT – Just ring one of the numbers in the CONTACT menu. In 2014 Wymondham Dementia Support Group worked closely with AgeUK Norfolk and the Town Council to enable Wymondham to become the first ‘Dementia Friendly’ community in Norfolk. We continue to work actively with other communities to help them develop facilities for those with dementia and also become ‘Dementia Friendly’. We continue to listen to those who use our services and develop our response to their needs accordingly. Watch the video below for information about Wymondham Dementia Support Group.